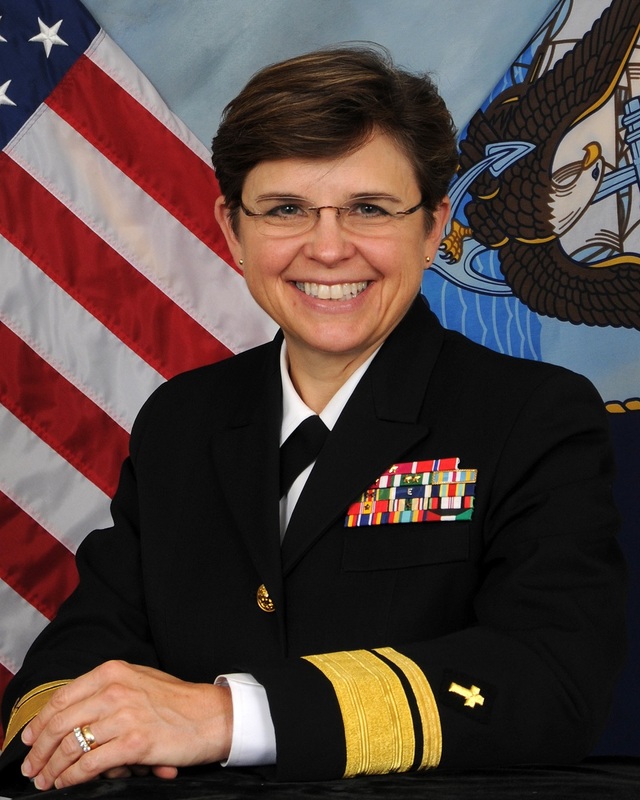 A native of Warrington, Pennsylvania, Rear Adm. Margaret Kibben entered active duty in the U.S. Navy in 1986 following studies for a bachelor’s degree from Goucher College in Towson, Maryland and her Masters of Divinity from Princeton Theological Seminary, Princeton, New Jersey. She also holds a Doctorate of Ministry from Princeton Theological Seminary, Princeton, New Jersey and a masters degree in national security and strategic studies from the Naval War College. Kibben was a senior fellow at the United States Institute of Peace. Kibben’s Marine Corps assignments have included Marine Corps Base Quantico, Virginia, where she served with Headquarters and Service Battalion, Security Battalion, the Brig, Marine Corps Air Facility and the president’s Helicopter Squadron, HMX-1. She also served with the Marines of Second Force Service Support Group Camp Lejeune, North Carolina, making deployments to both Turkey and Norway. Later she was assigned to the Marine Corps Combat Development Command in Quantico as the doctrine writer for Religious Ministry. Kibben’s Navy assignments include the U.S. Naval Academy in Annapolis, Maryland, as the first female chaplain. She was the Chaplain Corps historian at the Chaplain Resource Board and the command chaplain, USS San Diego (AFS 6), in Norfolk, Virginia. As U.S. 3rd Fleet chaplain, Kibben was responsible for the training and certification of all carrier strike group and expeditionary strike group religious ministry teams. She completed a deployment as the command chaplain, Combined Forces Command Afghanistan as an individual augmentee. Most recently, Kibben was detailed to the Office of the Chief of Chaplains, first serving as the director for Force Structure and Community Management and subsequently as the executive assistant to the chief of chaplains. She became the 18th chaplain of the United States Marine Corps and deputy chief of chaplains in July 2010. Kibben assumed her current duties as the 26th chief of chaplains of the Navy Aug. 1, 2014. Her personal awards include the Legion of Merit with one gold star, the Bronze Star, the Meritorious Service Medal with two gold stars, and the Navy Commendation Medal with two gold stars. Photo and text from the U.S. Navy website.